Gorilla lug nuts are engineered to exacting standards for uniformity and long life. 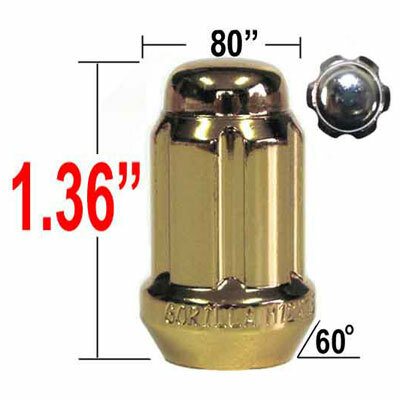 Durable quality are one of the many facets or Gorilla Gold Small Diameter Tuner lug nuts. You can reduce vehicle vibration when properly installing a new set of Gorilla Gold Small Diameter Tuner lug nuts. Enjoy the lasting beauty with a set of Gorilla Gold Small Diameter Tuner lug nuts. Received my Gold gorilla tuner tapered lug nuts in just 2-Days time, excellent outstanding service , Plus the product itself of my 20-Gold Acorn Bulge lug nuts came very well packed and protected, very happy and totally satisfied with the looks as well as the very well made Gold lug nuts, put them on my STS Cadillac, and you can see the difference right away, really Looks great, and does make a big more attractive difference, and brings out a true touch of class using these Gold Lug nuts instead of just the usual chrome . very satisfied with brandsport, and would use them again for any of my automotive type needs.